Not all raster data consists of aerial photographs. There are many other forms of raster data, and in many of those cases, it’s essential to symbolize the data properly so that it becomes properly visible and useful. The goal for this lesson: To change the symbology for a raster layer. Zoom to the extent of this layer by right-clicking on it in the Layer List and selecting Zoom to Layer. 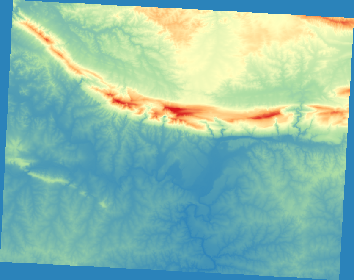 This dataset is a Digital Elevation Model (DEM). It’s a map of the elevation (altitude) of the terrain, allowing us to see where the mountains and valleys are, for example. 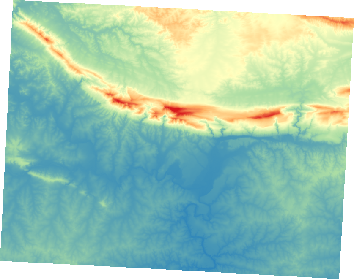 While each pixel of dataset of the previous section contained color information, in a DEM file, each pixel contains elevation values. QGIS has automatically applied a stretch to the image for visualization purposes, and we will learn more about how this works as we continue. By clicking on the button right above the Layers Panel. This will open the Layer Styling anel where you can switch to the Symbology tab. Choose the method you prefer to work with. When you load a raster file, if it is not a photo image like the ones of the previous section, the default style is set to a grayscale gradient. Let’s explore some of the features of this renderer. The default Color gradient is set to Black to white, meaning that low pixel values are black and while high values are white. Try to invert this setting to White to black and see the results. 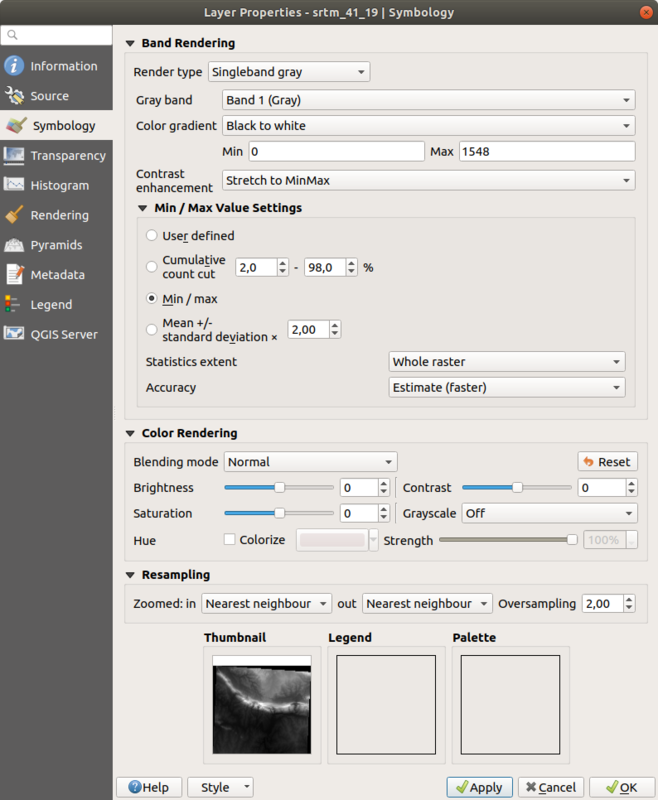 Very important is the Contrast enhancement parameter: by default it is set to Stretch to MinMax meaning that the grayscale is stretched to the minimum and maximum values. Mean +/- standard deviation: the values will be calculated according to the mean value and the standard deviation. Grayscales are not always great styles for raster layers. Let’s try to make the DEM layer more colorful. If it is not generated automatically click on the OK button to apply this classification to the DEM. This is an interesting way of looking at the DEM. 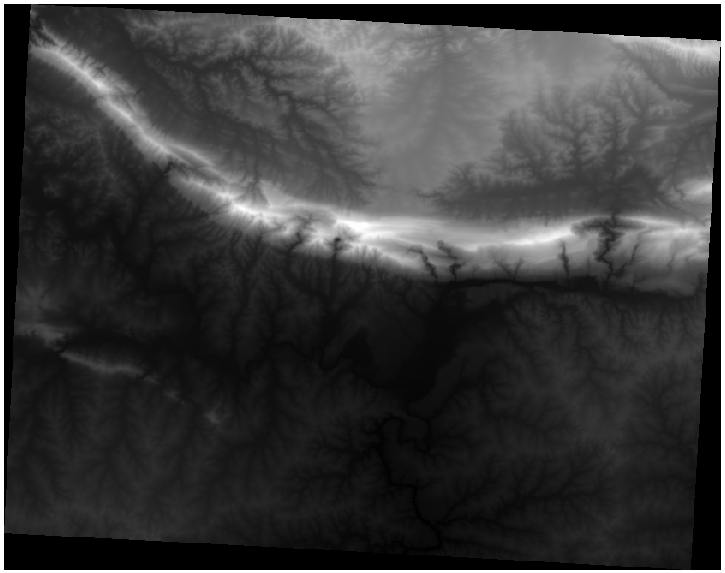 You’ll now see that the values of the raster are again properly displayed, with the darker colors representing valleys and the lighter ones, mountains. Sometimes changing the transparency of the whole raster layer can help you to see other layers covered by the raster itself and better understand the study area. Click on OK to close the dialog and see the changes. See? The corners are now 100% transparent. These are only the basic functions to get you started with raster symbology. 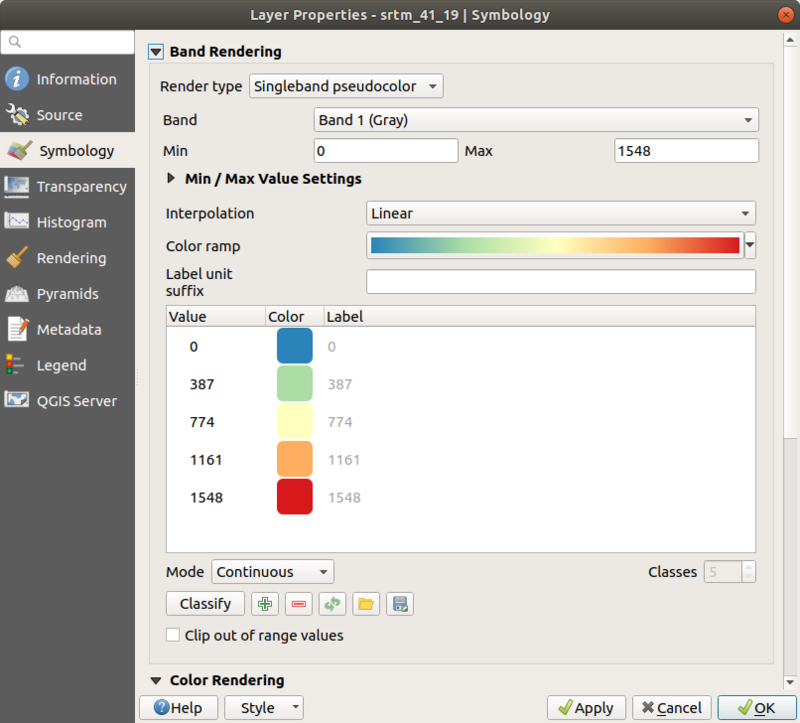 QGIS also allows you many other options, such as symbolizing a layer using paletted/unique values, representing different bands with different colors in a multispectral image or making an automatic hillshade effect (useful only with DEM raster files). Now that we can see our data displayed properly, let’s investigate how we can analyze it further.